With 33 unique rooms, Hotel Aalders has been owned and run by four generations of the Aalders family since 1955. Our charming 3-star hotel is located in the museumquarter and is ideally situated in the culteral centre of Amsterdam. Just a block from Van Gogh museum and Rijksmuseum and the beautiful historic citycentre, we will make sure you and your family, partner or other company will have an unforgettable experience in Amsterdam. We offer various types of rooms. There is always a room type that suits your travel company: single, double, triple or family room. Hotel Aalders offers 32 unique and charming rooms, only some steps away from the most important museums that Amsterdam has to offer you. Your room has a private bathroom, flat screen television, telephone, alarm clock and desk. After a good night's sleep there is a possibility to enjoy our delicious breakfast. Experience the culture authenticity of Amsterdam. 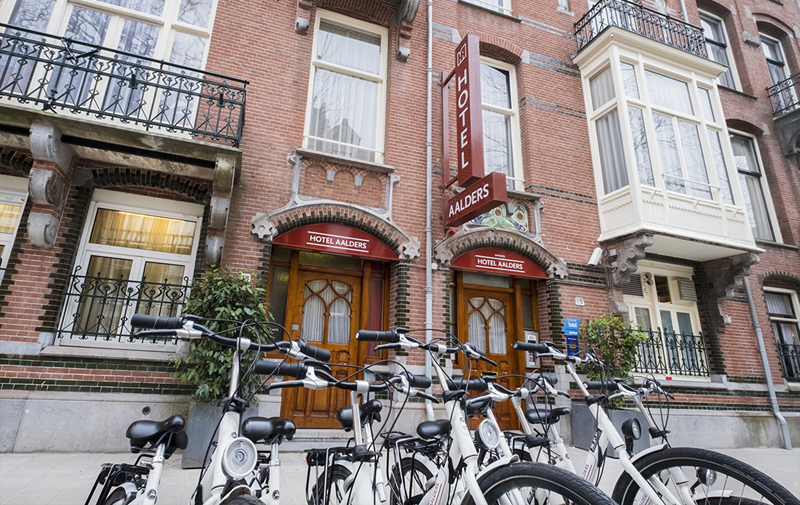 Hotel Aalders is located in a quiet street in the museumquarter near the Van Gogh Museum, Rijksmuseum, Stedelijk Museum and the Vondelpark. The Hotel is on walking distance of the citycentre. Hotel Aalders has a long history, the building was constructed in 1903 and during the 40s it housed an inn. In September 1955, the first generation of the Aalders family took up residence at this guesthouse. They decided in 1962 to baptize the guesthouse Hotel Aalders. The beginning of a wonderful family business.